Spring is a great time to go camping. The weather is warming up, the trees are blossoming and we’re sure you’re ready to get outdoors after a long winter. 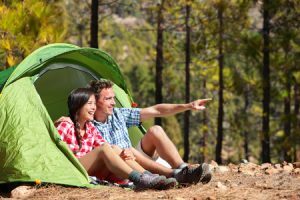 Read on for some handy tips for preparing for spring camping. After a winter spent in the garage, your gear may not be in top working order. No one wants to plan for a great camping trip only to discover that the tent has a giant hole in it or the camping stove is on the fritz. Make sure you’re good to go before heading out in the woods! Wait a minute; isn’t it supposed to be spring? Yes, but spring can bring unpredictable weather, including bouts of cold. What’s more, temperatures drop substantially at night, even after the sunniest May days. Bring sweaters, warm blankets and an insulating sleeping bag that will keep you warm even if the temps dip below freezing overnight. You’ve heard of April showers, right? Be prepared with tarps and a waterproof tent. Waterproof boots are a great idea as well, so you can enjoy a spring hike despite the inevitable puddles and mud. If you love to camp, come to Mattice Lake Outfitters and stay at our fully furnished outpost camps and wilderness lodges. We offer fantastic fishing and canoeing experiences that the whole family will love. Give us a call today at 1-800-411-0334 to book your stay!